Your fireplace has the potential to make a bold statement in your room, even if a fire isn’t currently burning. Since this is such an integral feature in the main living areas of your home, the eye is naturally drawn to it whenever you first enter a room. Many people prefer to keep the opening covered when it isn’t in use, making their home more energy efficient and keeping the mess of the fireplace away from the eyes of finicky guests. The best way to make your fireplace appealing when not in use or to protect your home from flying embers is with a fireplace cover. However, you don’t have to settle for the first plain item you see. You can find a wide array of cool fireplace covers that’ll perfectly match your home décor and style. 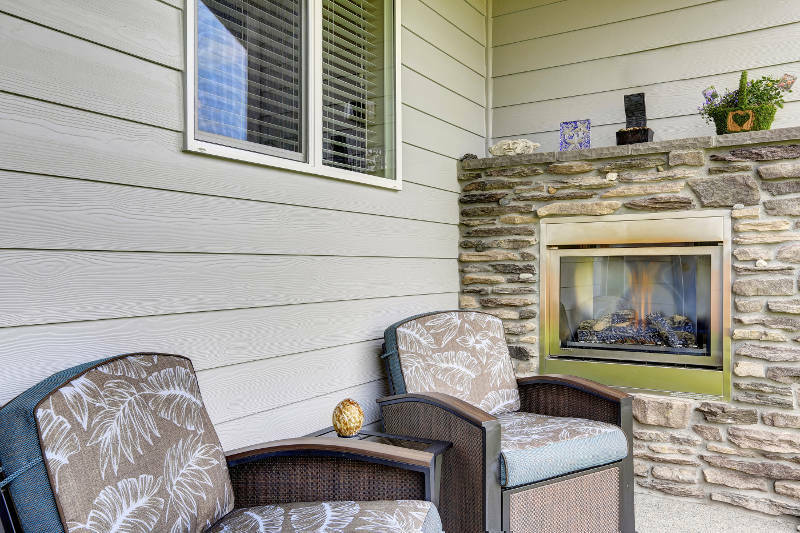 Need a new fireplace cover and looking for ideas to get you started? Here are our top 11 choices for a new cover that you won’t be able to pass up. Do you want to make a bold statement in your living areas? Add a little sparkle to a contemporary option for your fireplace cover. This is a sleek yet sophisticated option that’ll make your fireplace fit into the most modern design scheme. Allow the playful pattern to speak for itself. This fire cover is ideal for any home scene that needs a special accent piece to make the entire room come alive. If you want something that’s both affordable and contemporary, this golden chevron three-panel metal fireplace screen could be a perfect choice. It allows you to add a little interest to your hearth with its fun yet sophisticated pattern. The sleek lines make this a smooth and unobtrusive piece that still captures your attention immediately. Whether your home is modern or traditional, you’ll be able to use this screen to its maximum potential. Stick with the traditional decorating scheme by opting for this Plow & Hearth screen. The neutral black colors with the interior panels that resemble clear stained glass will make your space feel instantly more elegant. Examine the attention to detail with the mesh inserts and finely beveled edges that demonstrate true high-quality construction. This a refined option for a tastefully decorated room that could benefit from a more subdued and simple color palette. Is your decorating style a little more quirky and eclectic? You’ll love the whimsical charm of the circular pattern on this designer single-panel steel screen. Made from highly durable materials, you don’t lose any of the chic appearance in this gold cover that is bound to draw attention to your fireplace. Allow your guests to bask in the glitter and shine of the gold coloring on this stunning cover. This could be the finishing touch that your room has been desperate to find. Add a little depth to your fireplace with this multi-dimensional fireplace cover. The burnished brass shade makes your home feel rustic and elegant all at the same time. The beauty is really in its simplicity though. Each level of the screen is simple without the fancy fanfare and gaudy decorations of some screens. It would be perfect for a home with a very simple design scheme that emphasizes clean lines and rigid structure. An added bonus is that this fire cover is extremely affordable compared to some of the options found here. The plaid fireplace screen from Ansel is a wonderful addition to your home. The individual steel rods create a texture that’s difficult to find on many of the sleek and smooth fireplace covers available from leading manufacturers. This cover looks vaguely Asian-inspired for a relaxing atmosphere that lends itself to a more traditional setting. This cover may be on the pricey side of things but the antiqued zinc finish is ideal for homeowners who know what they want. 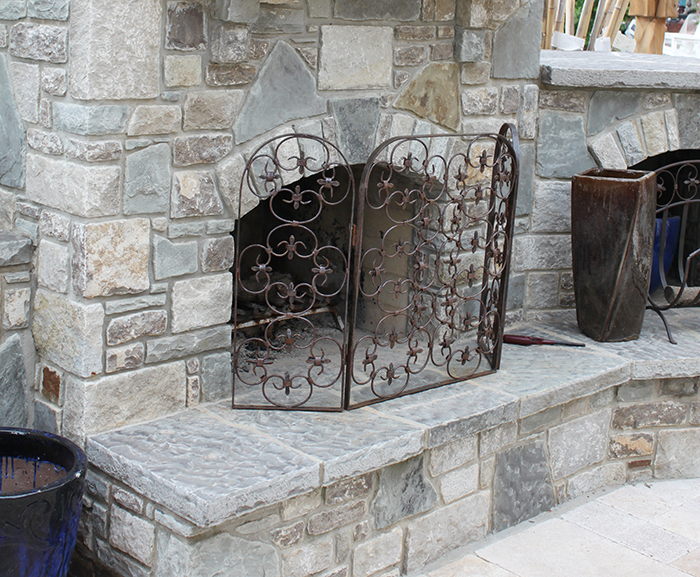 Maybe you aren’t searching for a fireplace cover that’ll detract from the earthy and rustic nature of the fireplace. The Blomus Glass Fireplace Screen gives you a clear view of the fire without the headache of flying ash and cinders. This clear glass screen is the ultimate option for homeowners who want the most modern addition. It can easily transform your room with its subtlety. This screen is ideal for homeowners who love their fireplace just as it is, with no need for more attention drawn to this focal point. Opt for a high-end investment in this Stanton Fireplace Screen, but know that you’ll get what you pay for here. The construction on this screen is extremely durable iron that’s made to last you for years to come. The sleek screen and clean lines are perfect for contemporary homeowners who are looking to enhance their space. With a little bit of metallic gleam, you still have elements of nature with its simple wooden handles. Every element of this screen is designed to improve the overall look and feel of your home. Spruce up your home with the unique flair of this Moroccan Twist Fireplace Triple Screen from Pottery Barn. You’ll fall instantly in love with the gentle curves and intriguing pattern presented by the hand-forged iron. The bronze finish is the final touch that it needs to transform into a stunning and timeless addition to the front of your fireplace. Perhaps the best feature of this fireplace cover is its ability to fit into the décor scheme of both modern and traditional homes with ease. Are you looking for a way to add some vibrant color to your fireplace? This model from Hayneedle could be the ideal way for you to introduce some bright splashes of burnt orange, stunning turquoise, and earthy greens. The metallic glint of these metals mixes with the creative and playful twist of the branches to form a one-of-a-kind fireplace screen that no one will be able to imitate. If you want your home to truly stand out, this fireplace cover is a must-have item. Another more permanent option to cover your fireplace with is the addition of fireplace glass doors. They provide more than just beauty, too. Glass doors help the efficiency of your fireplace and will boost the heat radiation from your fires. You’ll be able to more effectively heat a room with increased style. Plus, they make your fireplace a lot safer. Any stray sparks or embers won’t be able to leave your fireplace and children and pets will be completely safe from the fire. If your home could use a new fireplace cover, these top 11 options aren’t likely to be contenders that you’ll want to miss. Decide whether you want to introduce some whimsy into your home or stick with the traditional scheme you’re comfortable with. Ranging from affordable to more expensive, you’re certain to find a style and price that fits perfectly with your home’s needs. If you decide that fireplace glass doors are your style, then count on Early Times for the best products and service in all of Chicagoland. We’ve been keeping homes cleaner and safer for over 30 years – get a free quote now for glass doors or any of our other fireplace services!